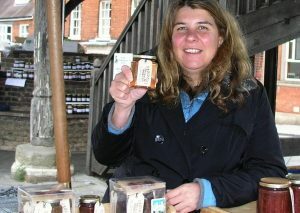 Peachey’s Preserves are quality handmade preserves produced locally in Alburgh, near Harleston in Norfolk. We use seasonal fruit, vegetables & herbs grown in the garden at home and we also source from other local growers in Norfolk and Suffolk wherever possible. Our preserves are made with some of the finest local ingredients. For example we use Aspall’s cyder and vinegar, and real ales from Grain Brewery, Alburgh & Humpty Dumpty Brewery, Reedham. For our more exotic produce, such as Seville Oranges, Mangos, some Chillis and Dried Fruits we source from Local Wholesalers. The range includes sweet and savoury jellies, jams, chutneys, pickles, a hot chilli jam and a fabulous Apricot and Norfolk Ale Chutney made with ale finished with honey. All the preserves are made in small batches and the labelling is a delightful country but chic style – they make lovely edible gifts.